With the commencement of the US Classic is almost here. The junior session is literally two hours from now. Yesterday, I had every intention of posting my impressions from all the podium training videos... But other things got in the way, so instead of posting it yesterday, I'm posting it right now. 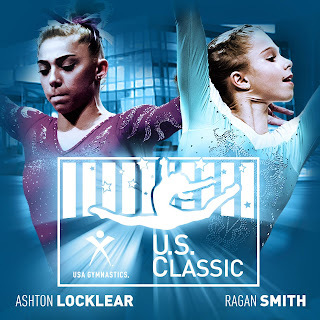 Ashton Locklear has taken over the role of "grandma" in the national team...says the 19-year-old. During an interview, Ashton talks about how she has taken on Aly's habits when it comes to sleeping. She explains in an interview that she's started going to bed early and frequently tells the younger girls at the Ranch to keep it down. Riley McCusker, Maggie Haney's latest protege. She made her senior debut this year after coming up on the elite scene to take the silver at the 2016 junior P&G Championships. She was shown on video training all four events, but in an interview, she revealed she's been dealing with injuries. Not only has she been dealing with injuries, but up until three and a half weeks ago, she was still in a cast. Uh, what now? Did we hear that right? Interview on FloGymnastics - explains the full depth of her injuries. Maile O'Keefe's aerial to two layout step outs on beam is perfection. Jordan Chiles' Dos Santos rivals Kennedy Baker's. Deanne Soza has form that is textbook perfect. Love seeing that OZONE leo in action! Go @ragansmith !! !